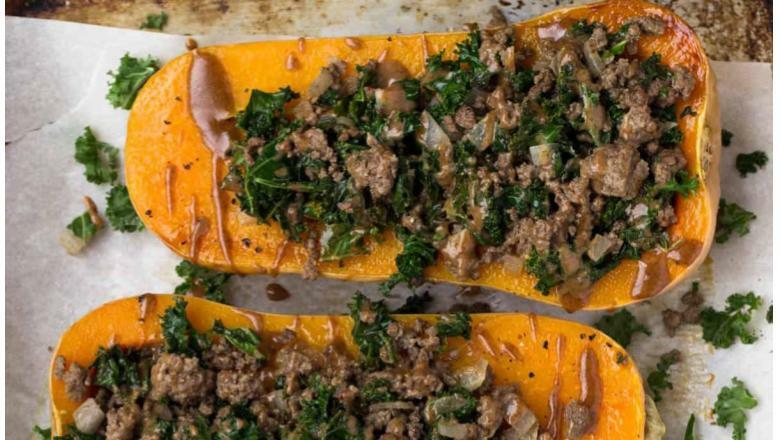 Crispy butternut squash topped with a tasty ground beef mixture makes for a perfect dinner. Serve with a side salad and enjoy! Preheat oven to 375 degrees Fahrenheit. Line 1-2 baking sheets with parchment paper. Drizzle some melted coconut oil, salt, and pepper on flesh of butternut squash. Place cut side down and roast for 40-45 minutes until soft. When there is 10 minutes left on the squash, make the beef. Heat a large well seasoned cast-iron skillet over medium heat. Once hot (about 1-2 minutes), add onions. Sauté for 2-3 minutes until soft. Add ground beef and peppers and break it up with the back of a large spoon. Cook for about 3 minutes, stirring occasionally. Add kale and cook for another 2-3 minutes until wilted and beef is cooked through and no pink remains. Add spices and lemon juice and stir through.